An incredible sea boat, this 50' Duffy was custom built by Atlantic Boat in Brooklin, Maine. Her current (2nd owner) a hugely experienced Yachtsman having owned a yacht yard and done extensive racing and cruising under sail as well as having owned a Nordhavn 46.Hechose this yacht as he could appreciate how easy she is to operate and own as well as for her efficient displacement speed cruising along with her high teens cruise speed when desired. Now only for sale as this octogenarian wishes to downsize. The current owners have done a number of upgrades, please read the full specs for details. 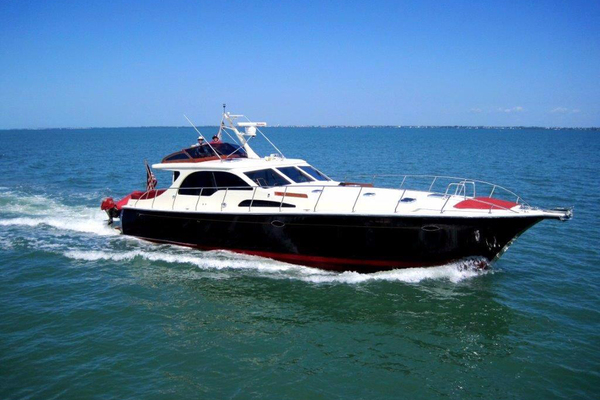 United Yacht Sales New Jersey would love to guide you through a personal showing of this 50' Duffy 50 Pilothouse Fast Trawler 2008. 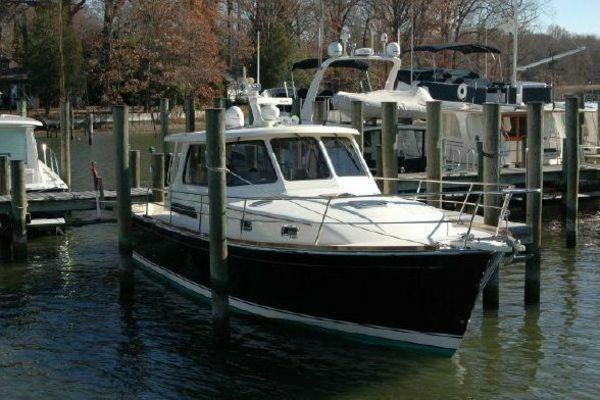 This yacht for sale is located in Yarmouth, Maine and priced at $599,500. For a showing please contact us by filling out the form on this page and we will get back to you shortly! Beautifully built to provide cruising luxury for a couple with room for guests or children when desired. Light abounds in all spaces with numerous windows hatches and ports providing superb natural ventilation as well. When natural ventilation is not enough 3 reverse cycle (heat and cool) units will keep in interior comfortable in a wide range of climates while, when cruising in cooler weather and not wanting to use the generator central Espar diesel cabin heat system is fitted, this system has outlets in all compartments inlcuding the heads. Excellent headroom of over 6'-10" throughout (the original owner is 6'-7"). Her bright and airy interior is finished in, what traditionalists would call "Herreshoff Style" with varnished teak trim on white flat panels, all cabin soles are varnished teak & holly. Lighting is extensive with overhead recessed Cantalupi halogen lights on dimmer at all headliner battens and swivel style reading laps at the berths and settees. Last but not least there is at least as much storage space as we have seen on any cruising yacht this size. Vessel Walk Thru: Starting forward is the Owner's Stateroomwith a full king sized berth with custom air mattress. Below the berth there are 6 large cargo drawers and above the berth there are full length storage shelves with fiddle. Aft and to P&S are his and hers hanging lockers with storage lockers above. Aft and to starboard is a full sized head featuring Vacu-flush W.C., Corian topped vanity with undermount, ceramic sink and storage. Adjacent to the head is a laundry closet with full sized washer and properly vented dryer units. Oppoiste to port is a 2nd "head" with separate stall shower compartment, vanity and sink (no W.C. in this 2nd head). Up 4 steps (there is a hatch and door to isolate the forward cabin when desired) to the wheelhouse/salon with helm station to starboard. Wing doors both P&S side allow easy access to the side decks, aft and to port is an over 7' long L-shaped settee with storage under and book shleves with fiddle above. forward and to port is a nav. area and chart storage along with a large drawer for other navigational utensils. Heading aft and down three steps one finds a guest stateroom to starboard with a bunk bed arrangement. Below the lower berth there is top load access type storage with additional storage forward in in upper hanging locker and then 6 drawers below. To port and aft is as spacious and well appointed a U-shapedgalley as one finds on a yacht of this size. As beautifully appointed as the rest of the vessel; there are Corain counter tops, NovaCool full height refrigerator freezer box with ice maker, 3 burner ceramic cooktop, convection microwave and a single basin stainless steel sink. Storage in the galley is extensive (see photo). The aft end of the galley counter top overhangs providing a "breakfast bar" or spot to nurse a cup of coffee while chatting with the chef! Just aft of the galley is a small desk while inboard is the guest/day head. The head features a small vanity with undermount ceramic sink and Vacuflush W.C. Throughout this Duffy 50 is a delight; beautifully finished, bright and airy. Fitted put for coastal cruising with all electroncs located at the helm station starboard side. Semi-displacement Spencer Lincoln designed "downeast" type hull with full skeg and protected propeller and rudder built of foam cored fiberglass topsideswith solid fiberglass bottom from the keel to the turn of the bilge with vinyl-ester resin in the exterior laminate. The hull is finished with Jade Mist Green Awlgrip with a White Boot Stripe and green antifouling. The house and deck structure is molded fiberglass with closed cell foam coring and Oyster White Awlgrip finish with Gray Awlgrip with non-skid in the cockpit and Moondust Awlgrip on the side decks with non-skid. There is a small but functional "flying bridge" accessed via the ladder and inlcudes basic navigational inturments, Autopilot, VHF, thruster and engine controls. To improve comfort and ease of movement about the yacht the current owners have added stainless steel rails to the after side decks and to the house top.